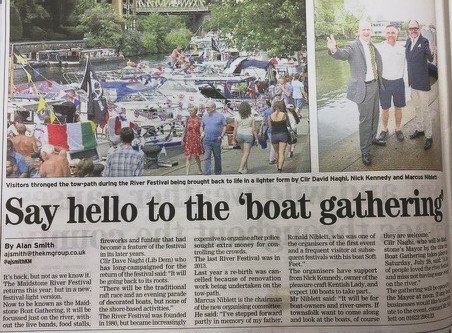 Our non-tidal partners, the Medway River Users Association (aka River Medway Boaters on Facebook) have just announced that the Maidstone River Festival, now known as the “Gathering of Boats” is back on the last weekend in July.The new Mayor of Maidstone is fully behind this event and will be presenting the trophies. For those who haven’t ventured upstream yet, the non-tidal Medway is well worth a visit if you can get your boat under Aylesford bridge. This entry was posted in Motor cruising, Non-tidal Meway by admiral. Bookmark the permalink.